Ferrets are the third most common "uncaged" pet in the United States behind dogs and cats. These members of the weasel family are lively, smart and affectionate. They can make excellent pets if you are willing to give them a great deal of care and attention. They’ll repay you with entertaining antics and loving companionship. Before you commit to bringing one of these little guys into your home, be sure what you're getting into. You’ll need to provide a sturdy, escape-proof cage for your ferret, the larger the better to provide room to play and explore. The enclosure should have features such as ramps, tubes, ladders and sleeping hammocks. These features will help keep your ferret friend fit and mentally active. These animals are not meant to be caged all the time, which is why they are considered uncaged pets. They are extremely active -- they need at least four hours every day of supervised play time and interaction with you. However, their intelligence and natural curiosity mean they can and will get into anything that isn’t ferret-proofed. You’ll need latches on cupboards, electrical cord and outlet protectors, and barricades tightly blocking any areas you don’t want your ferret to squeeze into or under. Ensure your little guy never gets a chance to leave the house. A domesticated ferret will not survive long in the wild. Ferrets are obligate carnivores, which means they must get their nutrients from protein and fat. A proper ferret diet should contain at least 34 percent meat protein and 22 percent fat. Do not give your furry friend vegetables, as hamsters can’t digest vegetable protein, which may cause choking or intestinal blockages. Likewise, fruit is not easily digested and is high in fructose, which can cause health problems. High-quality specialized ferret diets provide all the nutrients a ferret needs to remain healthy. Your ferret is incredibly playful, and his favorite toy will likely be you. He craves your attention and wants to bond with you. If you keep your little guy caged too much or do not interact with him enough, he can become depressed and develop health problems. Your ferret is an instinctual hunter; many of his games will simulate hunting. During the course of such play, he may occasionally nip your fingers. You need to gently train your ferret not to nip. When he bites, say no and gently tap his nose. Then place him back in his cage for a while. You'll need to repeat this training every time he nips, probably quite a few times before it sinks in, but he'll be a much more enjoyable friend when he finally gets it. Ferrets are susceptible to a number of health conditions, so you’ll need to be prepared to provide regular veterinary care. Like dogs, ferrets need to be vaccinated against distemper and rabies, and regularly checked for internal and external parasites. Consider spaying or neutering your furry friend. 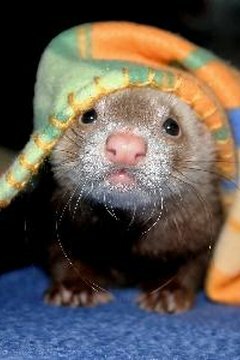 An unaltered female ferret will remain in heat for six months if she doesn’t mate. This can cause behavior changes and health problems. Unneutered males can become aggressive and their scent glands can put off a strong odor. A Ferret in Your Future? Ferrets make fun and fascinating pets. But since they're a handful to care for, they're not for everyone. Be positive that you have the time, energy and finances to properly care for a ferret before you decide to bring one of these entertaining and affectionate creatures into your home.